Two groundbreaking research studies last year led to a call for the veterinarian community to change its approach in fighting the rising incidence of heartworm infection in dogs. 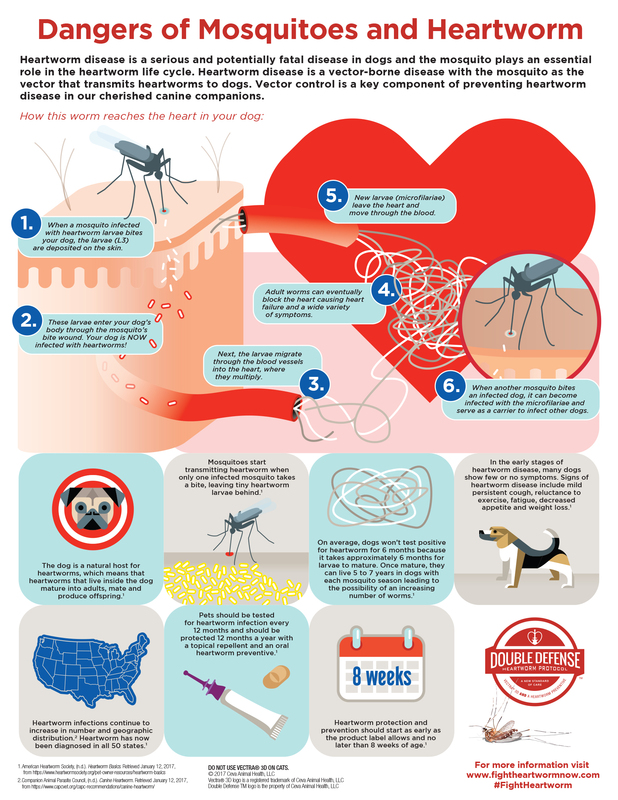 Aptly called the “double defense” protocol, the research clearly shows the value in fighting both the vector – the mosquito – and the heartworm. Rather than rely solely on an oral heartworm preventive, the studies support also using a topical parasiticide to repel and kill mosquitoes. The story became a must read in the trade. In fact, DVM 360 ranked it as one of the Top 10 news stories impacting the veterinarian community. The highly regarded magazine and its related digital news feeds serve the veterinarian community with the latest developments in the industry. But the story is just beginning as Ceva Animal Health, LLC, continues an extensive campaign to educate the veterinarian community and dog owners on the research and the benefits of a multimodal approach in preventing the often devastating impact of heartworm disease. Conference held last March in Las Vegas. John McCall, MS, PhD, conducted a study that demonstrated Vectra® 3D, a topical parasiticide, played a leading role in a double defense protocol of repelling and killing mosquitoes. The Phase 1 research found that Vectra® 3D for Dogs was more than 95 percent effective in repelling and killing mosquitoes for 28 days after treatment. Additionally, by repelling and killing mosquitoes, the topical parasiticide was more than 99 percent effective in blocking the transmission of microfilariae from dogs to mosquitoes in this study. Consequently, McCall, a professor emeritus in the Department of Infectious Diseases at the University of Georgia, College of Veterinary Medicine, urged a new approach in fighting heartworm disease. “After fighting heartworm the same way for decades, it’s time for a new approach. And that includes fighting the vector as well as the heartworm. The overall anti-feeding efficacy of Vectra® 3D was 98.5 percent. No heartworms were found in the Vectra® 3D and heartworm preventive treated group. The combination of Vectra® 3D for mosquito control and a heartworm preventive had superior efficacy for protecting dogs against heartworm infection compared to a heartworm preventive alone in Phase 2 of the study. Rehm said that even though it’s “easy” for veterinarians to kill heartworms in infected animals, doing so makes animals sicker in the short term, and necropsies of animals years after treatment can reveal petrified worms in “unbelievable places—around the valve of the heart, in major arteries and so on.” Therefore, prevention is vastly preferable to treatment, Rehm noted. 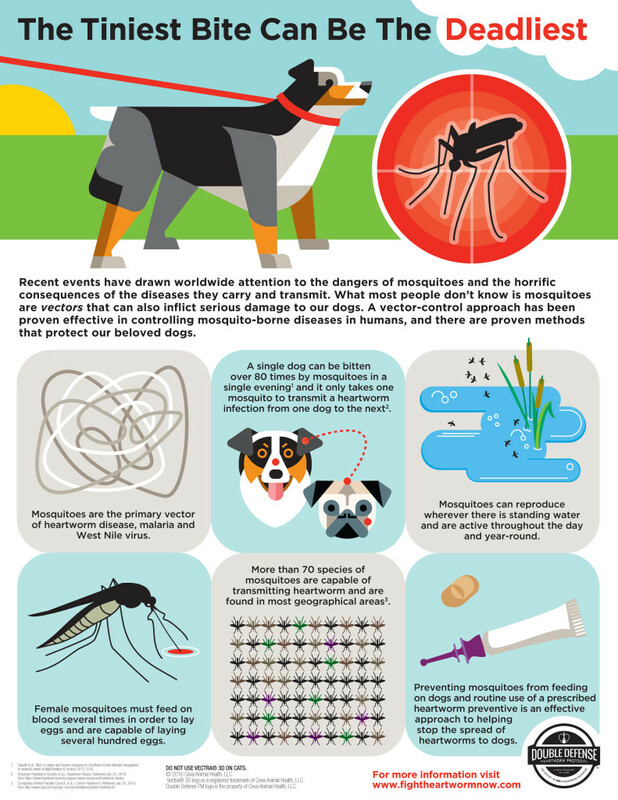 Backed with this research, the Companion Animal Parasite Council (CAPC) updated the Control and Prevention section of its Canine Heartworm Guidelines to include the statement that “limiting contact with mosquitoes further reduces risk of heartworm infection.” This may in part, be accomplished through the use of mosquito repellents approved for use in dogs. Ceva continues its quest to educate the veterinarian community on the importance of McCall’s research and the call to adopt a double defense protocol in fighting heartworm disease. To do so, the companion animal healthcare company will launch a series of informative sessions for veterinarians on the frontline of providing the best care to lessen the risk of heartworm disease. To do so, Ceva will host several educational forums with state veterinary medical associations and at selected regional and national conferences. The sessions began on Jan. 22 with the Missouri Veterinary Medical Association (MOVMA) and continue throughout 2017. Each forum will feature leading experts in a variety of fields – research entomology, practitioners and behaviorists – to explain the new double defense protocol, update veterinarians on managing vector-borne diseases and learning more about other areas such as behavior to improve the care provided to pets and to enhance their practices. Dr. McCall will attend many of these sessions to detail his research and his conclusions, as well as to address questions. A wealth of other experts will add to the discussion and educational forums. As an example, Robert Wirtz, PhD, retired chief of the Entomology Branch of the Centers for Disease Control, will speak from his vast experience in preventing mosquito-borne diseases throughout the world. Wirtz also sees the double-defense protocol as a clear way for the veterinarian community to advance the One Health Initiative. This worldwide strategy recognizes the need to expand interdisciplinary collaborations and communications in all aspects of health care for humans, animals and the environment. Byron Blagburn, PhD, parasitology professor and researcher at Auburn University, will address the new research and what it may mean for veterinarians and their clients. “We understand that the fight against heartworm disease is an important story that never ends,” Wallace says. “We want to make sure that the veterinarian community receives all the information and resources it needs to provide the best protection possible. Ceva also has made a significant investment in the industry’s top organizations that play a leading role in the fight against heartworm disease and other issues impacting the veterinarian community and companion animals. The company is a platinum sponsor of both the American Heartworm Society and Companion Animal Parasite Council, two distinguished organizations that have a long history in advancing the care and treatment of pets and ultimately people in the battle against parasitic infections. Ceva also provides support to the CATalyst Council, Veterinary Medical Association Executives, the Fear Free® Initiative, American Animal Hospital Association, American Association of Feline Practitioners, American College of Veterinary Behaviorists and American College of Veterinary Dermatology. 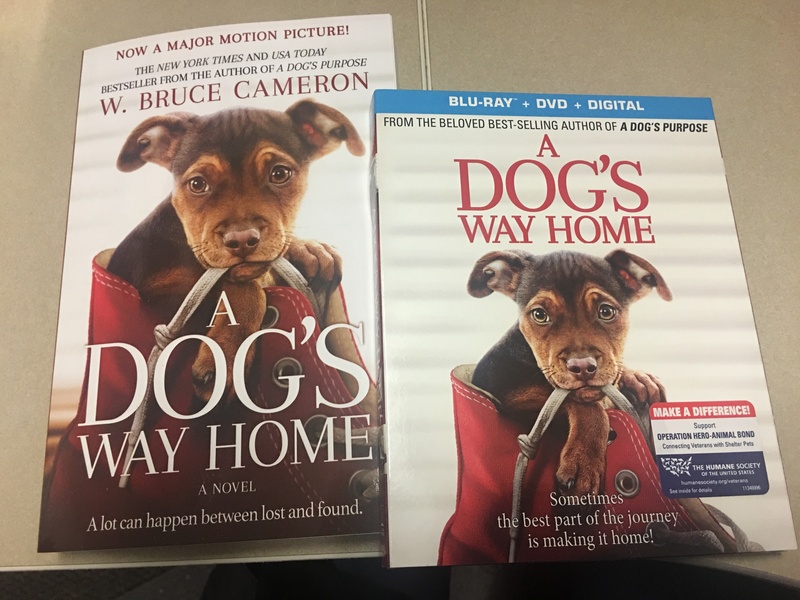 “Ceva knows the importance of supporting industry organizations that do so much to advance scientific progress and educate the veterinarian community and the public on heartworm disease and prevention,” Wallace says. “This is an especially appropriate time to show our support as the emphasis on the importance of fighting both the vector and the heartworm is more important than ever before,” Wallace adds. The double defense story is worth telling and one that Ceva plans to share with the veterinarian community, industry and public during 2017 and beyond. Visit fightheartwormnow.com for more on the Double Defense protocol. Follow Ceva Animal Health, LLC on Twitter. Contact Lea-Ann Germinder at lgerminder@germinder.com for more information.